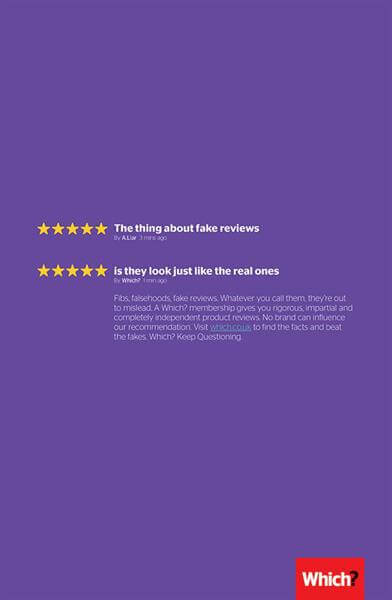 Many of us who would consider ourselves techy-savvy individuals are able to spot fake reviews relatively easily, however, with so many of the general public still getting their head around how to safely browse online, fake reviews really can sometimes fool even the best of us. Fake reviews are to shoppers, what ‘fake news’ is Donald Trump, a right nuisance – except one is a legitimate concern and the other is the ramblings of a madman… For many of those who shop online, they may not be aware of the extent that retailers will go to get positive reviews online. 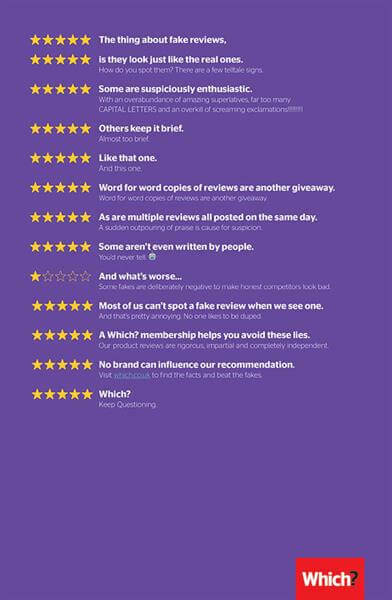 This can include reimbursing shoppers for purchases on sites such as Amazon in exchange for positive reviews, sellers offering refunds in exchange for five-star ratings and even refusing to reimburse those who left actual ‘real’ honest reviews, which may not have been to the sellers liking. Which? decided to create a guide which can help people make more informed purchases and how to spot fake reviews in the process. A bespoke page with some of the core questions that consumers might have is easily navigatable and offers up videos and text to best advise people how to buy online. It also advises people against participating in online groups in which Amazon sellers request a five-star review in exchange for a full refund. This helpful little guide was accompanied by a series of ads which ran in London most popular Tube and train stations, alongside a printed series in the Evening Standard, airtime on LBC/Global and an editorial investigation in the online and print version of the Which? magazine. Habito has made an appearance on our blog before, with their print ads created by Californian-based Jimbo Phillip. This time they’ve elevated themselves to this video ad, created in the same ‘eye-popping’ style as the previous entries into the mortgage broking industry. Their disruptive nature and completely over-the-top approach is nothing like what the mortgage broking industry has seen before and looks to target those confused Millennials who are currently struggling with figuring out the housing market. The ad represents the overwhelming amount of jargon that you’re faced with when attempting to apply for a mortgage. The whole process is pretty damn hellish and is portrayed by a poor unsuspecting woman who types the words mortgage broker into a search engine. She’s hit with a boatload of acronyms and jargon which subsequently bowl her over and lead her computer screen to convulse and spew green bile. Backed by Noisia’s Machine Gun, the final product is something that’s memorable and finely targeted to the desired demographic, standing out in a sea of suits and scepticism. 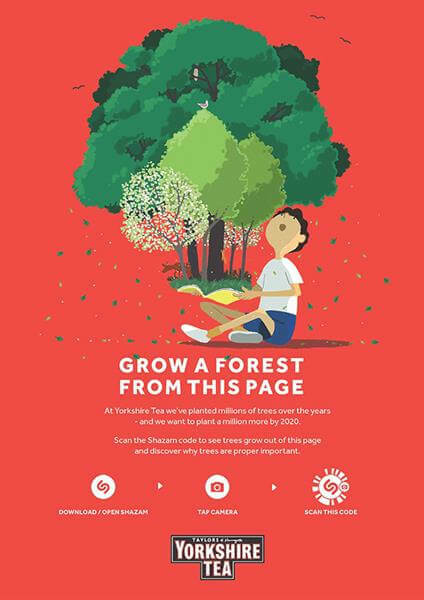 Five years ago, Yorkshire Tea made a pledge to plant one million trees across the UK and in Kenya. 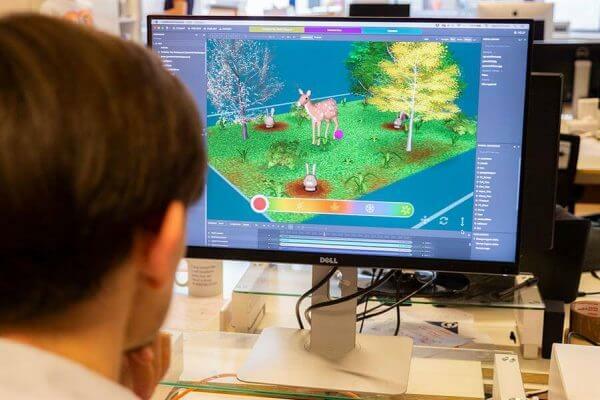 Now, in year four, the latest instalment in the campaigns comes in the form of an AR experience which transports users to the forests, both locally and overseas. The interactive platform allows users to plant seeds, pick fruit for farmers to sell and most importantly, teaches users about environmental sustainability. 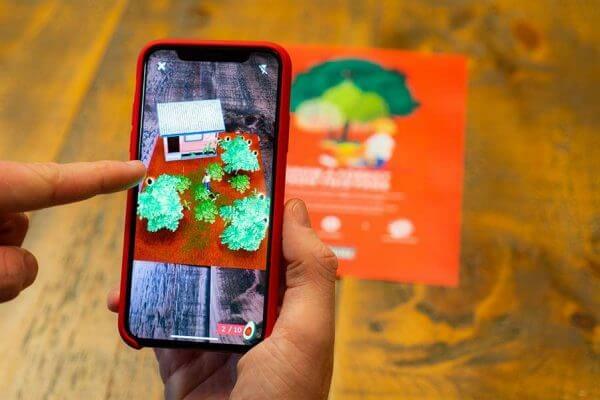 The app aims to bring to life the brands passion for trees, targetting families, particularly those with young children, to better understand the importance of trees in the wider world whilst engaging with them in a fun way. The experience is accessed by scanning the full page press ad, through using the camera in the Shazam app. Print ads can be found within a number of magazine titles and supplements in newspapers, including The Evening Standard, The Observer and The Times. Copies of activity sheets were also distributed to schools across the UK to try and drive a deeper understanding of the project to the target demographic. For the annual Sleep Out event, End Youth Homelessness created this series of print ads to encourage more participants to swap their beds for sleeping bags for one night, in which participants raise funds to help homeless and disadvantaged young people in the UK. This year’s posters offer multilayered messaging which offers two different perspectives. Reading one set of the text presents the reader with the dichotomy of the Sleep Out event, where people come together to raise funds and awareness. 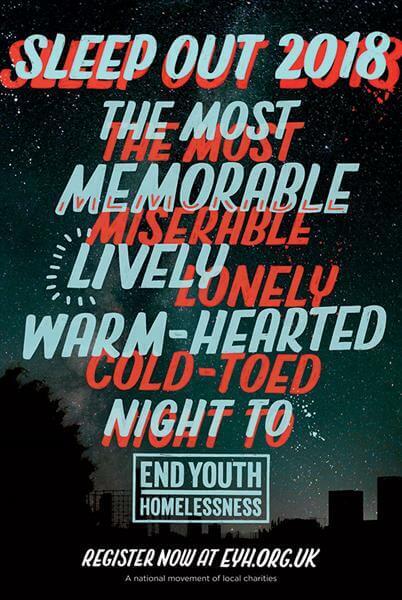 The shadow version of the text flips the messaging on its head, referring to the experiences of homeless young people who are forced to live on the street. 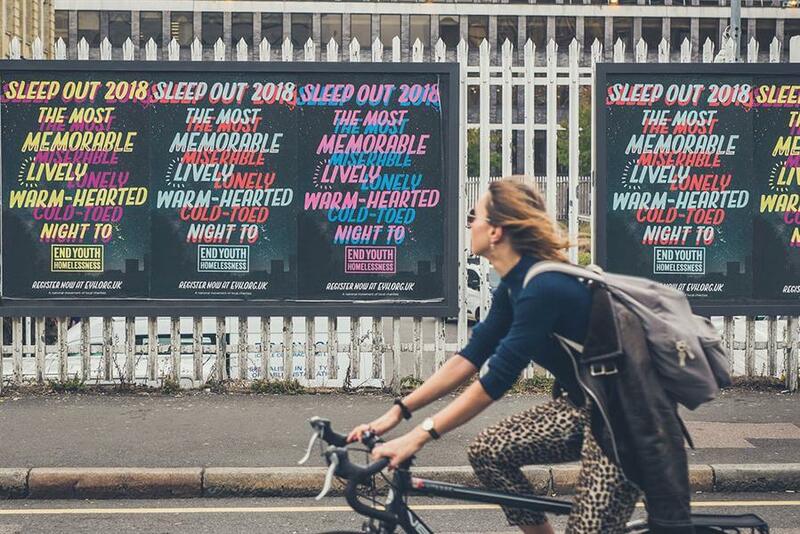 The campaign is currently appearing on 110 sites across the UK, with events occurring on different dates in major cities and towns. Each site has a different target fundraising amount alongside varying registration fees. 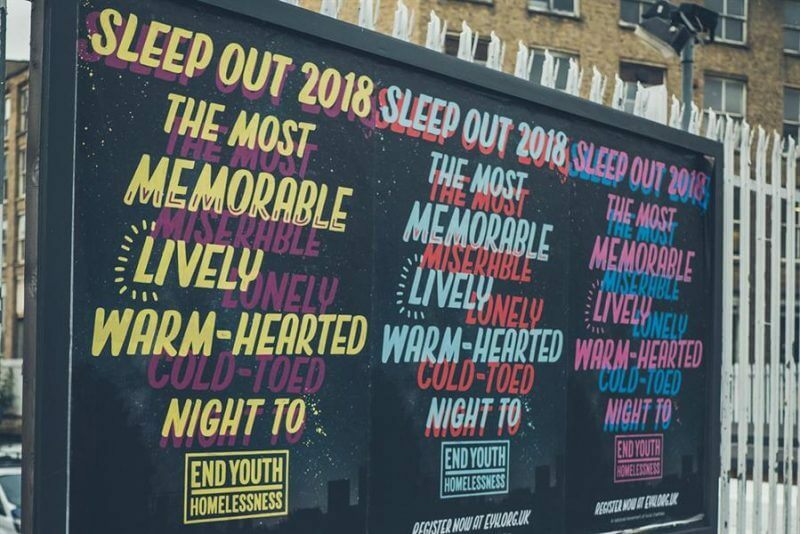 The Sleep Out will be held in a number of locations, including Manchester, Birmingham Cardiff, Bristol and a corporate event in London. Between now and Christmas, you might see Freshpet’s very first tv campaign crop up. Although not significantly profound, we all love a good doggo advert and this one is no exception. Featuring a bunch of sad pooches, who are feeling uninspired by ‘the current standard of dog food on the market’, this ad offers a 30-second respite from the barrage of usual seasonal ads. Have no fear though, those sad doggo faces are turned back the right way up at the end of the ad when they finally taste the Freshpet dog food product. We did say it wasn’t profound… but dammit, what kind of monster doesn’t want to see adorable pups on the tv screen? !